Acrylic Painting on Gallery Wrapped Canvas. 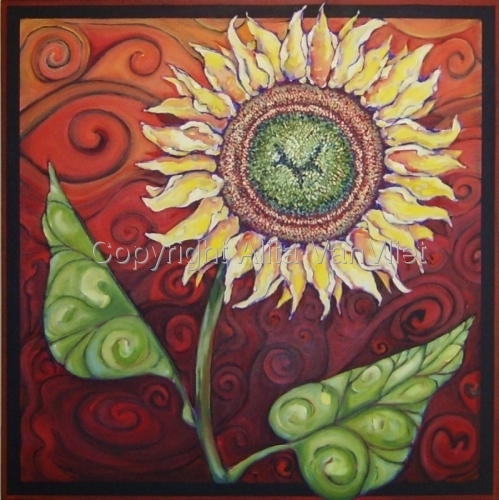 This whimsical and bold expression of a sunflower brings a joyful mood to any room. It's eye catching colors lends itself perfectly as the focal point in any room whether it is hung above the fireplace, sofa, bed, dining table or at the end of a hall. It is sure to brighten any space. This piece is painted on an extra deep 1 1/2" thick gallery canvas. The sides of the canvas are cleanly finished (no staples) and hand painted in red with the intention that it be hung without a frame. Acrylic Painting on Canvas. 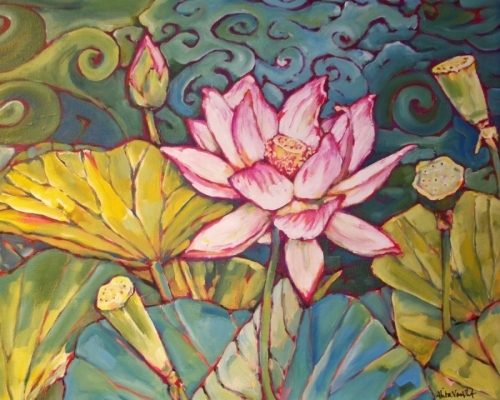 This is a lovely piece with it's graceful Lotus flower, bud and seedpods against the swirling waters in the background. Striking! This painting was done from a cropped photo I took on a bright sunny day while on a walk through a field of California poppies. The light was striking this particular flower in such a way that it truly blocked out portions of the flowers color, turning it to white. I cropped the image, zooming into the flower's center and was inspired by the interesting shapes the white light and colors created. Capturing the graceful curved lines of a Lotus flower in bud this piece has an abstract feel with it's simple shapes, interesting color variation, and unique perspective. A striking piece that reflects the purity and grace of the Lotus. Rich mauve and cool blue greens painted over an under painting of pure black gives this piece depth and a sense of peace and tranquility. Acrylic Paint on Canvas. 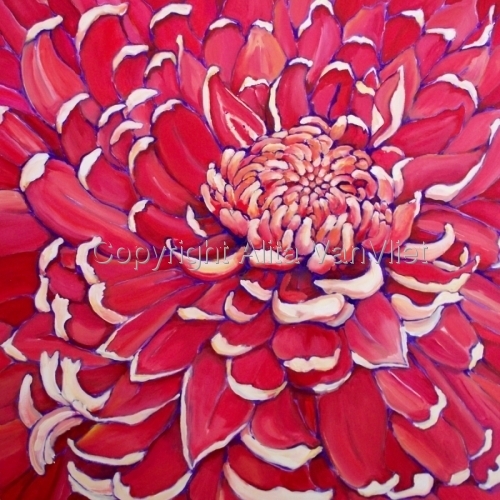 This bright floral painting will command attention and "WOW' the viewer where ever it is hung. 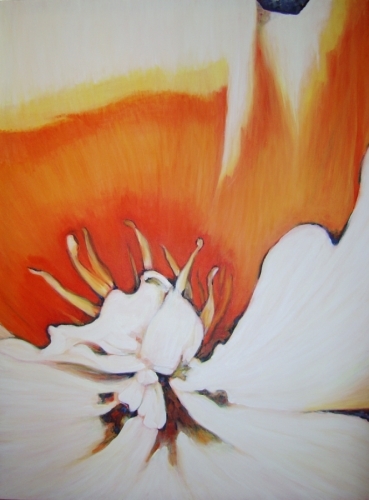 Covering the entire canvas, it is a virtual bee's eye view of the flower's gracefully arranged petals. Shades of pink, red with a hint of deep purple. Gorgeous! Acrylic Paint on Gallery Wrapped Canvas with Gold Leaf. 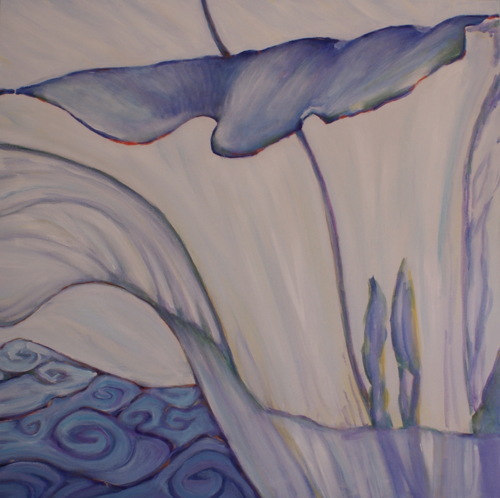 This expressive piece with it's swirling fern leaves and shades of blue greens has a zen-like quality. Painted in layers it has great depth and texture. Look close and you'll see bits of red, gold and black underneath the greens. Painted on an extra thick 1 1/2" gallery wrapped canvas. The painting wraps around the sides and are painted in black (no visible staples on sides). Ready to hang - no additional frame required. Acrylic painting on Canvas. 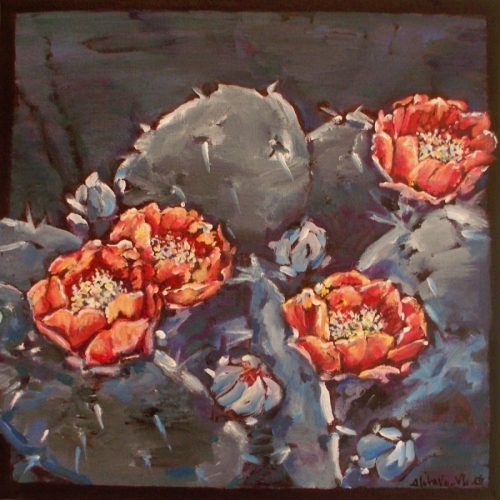 This is a delightful painting with it's orange red flowers against shades of blue gray and black. A nice addition for those looking for a desert inspired piece. Prints available only (original sold). Acrylic Painting on Canvas. 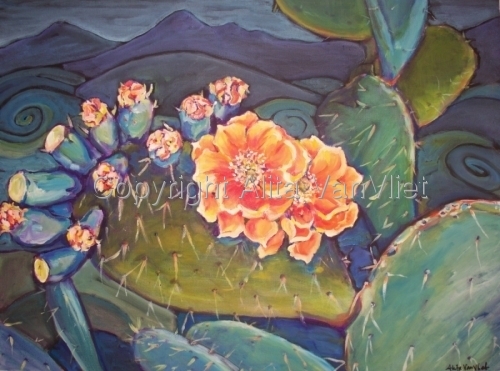 Orange cactus flowers, prickly pear fruit and thorny leaves dramatically set against a background of blue mountains. Painted while on a trip to the California desert near Palm Springs. Painted white frame finishes and sets off the blues and greens (not shown in image). 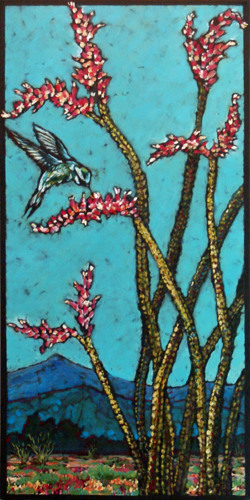 Available with black wood frame (add $40.00), otherwise unframed. 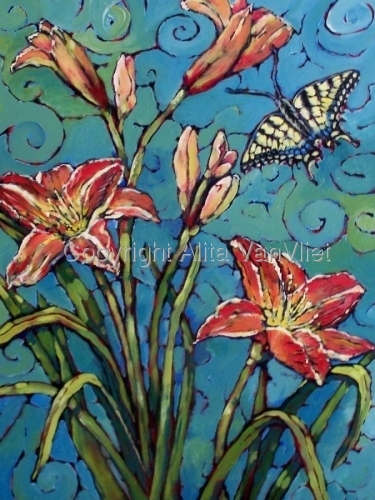 These lilies were painted from those I have planted in my studio garden. Such gorgeous reds and oranges against the blues and greens. As I was working, a beautiful Swallow Tail butterfly flew by a number of times so of course I had to include it the painting! 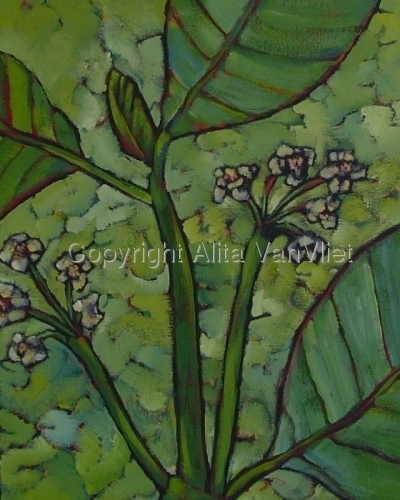 Soft creamy white flowers against shades of green, this painting began with a black background (look close and you'll see). I painted the flower and leaves red first, then layered over with the greens and white, and bits of gold. Swirls of yellow and white boldly contrast against the brilliant red poppies. One of three painted on vertical canvases using my layering technique. Swirls of yellow and white boldly contrast against the red poppies. 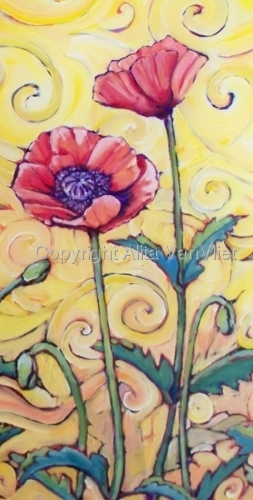 One of three vertical pieces painted of these red poppies. 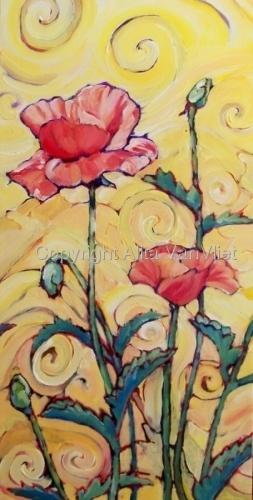 Swirls of yellow and white boldly contrast against the red poppies in this acrylic painting. 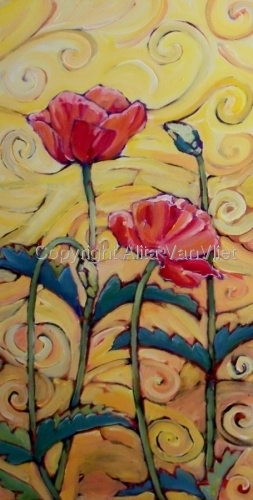 One of three vertical pieces painted of these red poppies. Beautiful blue shadows highlight the elegant form of the the Southern Magnolia flower in full bloom. This acrylic painting was done using a layering technique and started with a background of black (you can see the black if you look close). 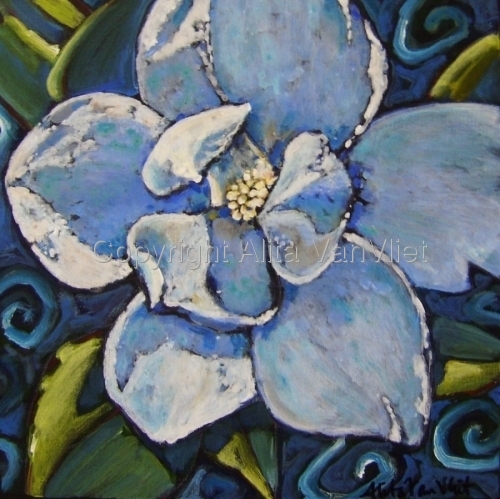 Original is painted with a broad black frame surrounding the flower. 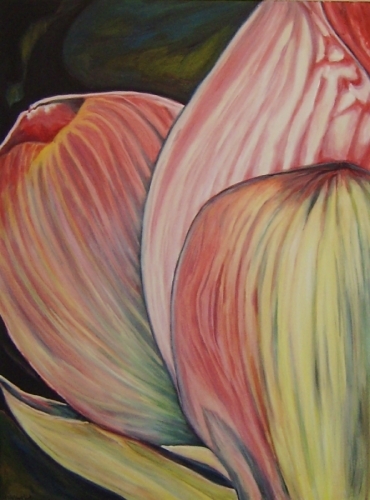 This is one of three pieces painted of the white lotus with it's unusual seed pod and bold leaves. Rising above the water the buds are just about to open as a bee buzzes by! Painted with acrylic paint and using a layering technique. Petals and leaves wrap around the sides of the painting (original) and is intended to be hung with out a frame. 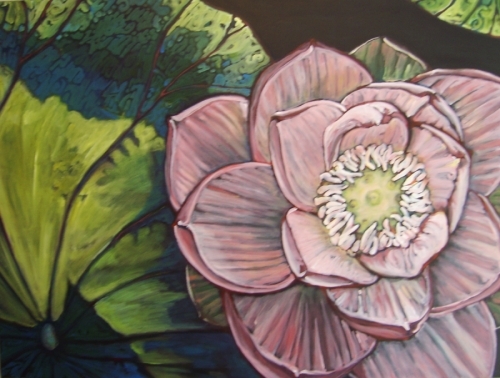 This is one of three pieces painted of the white lotus in full bloom above it's magnificent leaves. Painted with acrylic paint and using a layering technique and a bold color palette. Petals and leaves wrap around the canvas sides (original) and is meant to hung without a frame. This is one of three pieces painted of the white lotus flower buds and unusual seed pod rising above it's magnificent leaves. Painted with acrylic paint and using a layering technique and a bold color palette. Petals and leaves wrap around the canvas sides (on original) and is meant to hung without a frame. Acrylic painting on canvas. 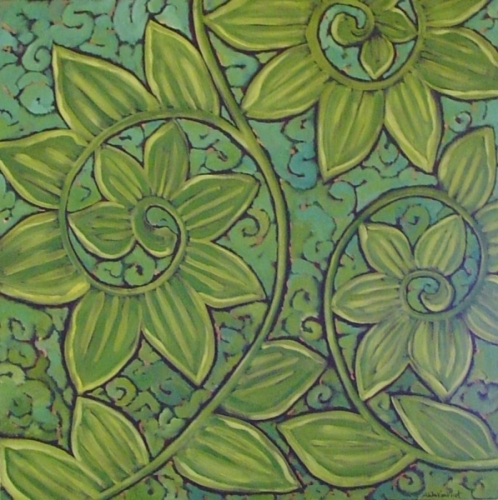 Painted from an overhead perspective, the leaves of the Echeveria plant whorl from the center and extend over the painted framed edge of the canvas. Painted using a layering technique, starting with a black canvas and adding rich hues of warm rusty reds. Framed with swirls that represent the hot desert breezes of Southern California's desert. 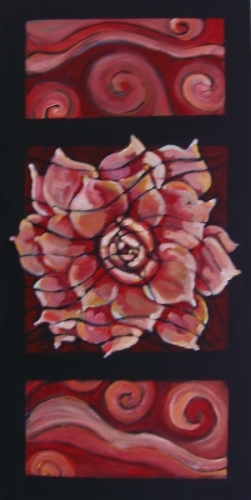 Original painting on a wrapped canvas so can be hung without a frame. Acrylic painting on canvas. Painted from an overhead perspective, the leaves of the Agave plant whorl from the center and extend over the painted framed edge of the canvas. Painted using a layering technique, starting with a black canvas and adding rich hues of warm rusty reds. Framed with swirls that represent the hot desert breezes of Southern California's desert. Original painting on a wrapped canvas so can be hung without a frame. A close up view of the Datura otherwise known as Loco Weed or Jimson Weed. The artist paints a view here in a semi abstract style featuring the beautiful effect of morning light on the transparent white petals.